A SUP foiling, a windfoiling and a shortboard session for me yesterday. Here's Jason foiling in the early morning glare. I windfoiled there after the wind got strong and that was pretty horrible. The wind and the waves had pretty much the same direction and it was hard to go downwind once I caught a wave, as the gusts were shaking my 2.8 badly and the whole thing was pretty scary. I don't think I'll do that again. Wave windfoiling requires sideshore wind. Can probably still do if it's onshore, but it needs to be light/steady. Kai Lenny left the harbor with a fleet of 2 boats and 6 skies, but I haven't seen any photos on the social media yet. Yuri Soledade was faster and posted this image of Jaws by John Varney. I guess that is considered "small". The real bay on the west side was well overhead at the Cave. This is Ferdi tackling waves on that side of the island. Photo by Jimmie Hepp from this gallery. Russ instead went sailing in his backyard. A session that required a hell lot of local knowledge. You can see him mid top turn checking what's behind to decide a possible early kick out, which is something he did 90% of the times. This one instead was followed by a big one so he rode it all the way to the inside. No indication of southerly energy at the buoys, I'm gonna call it flat. 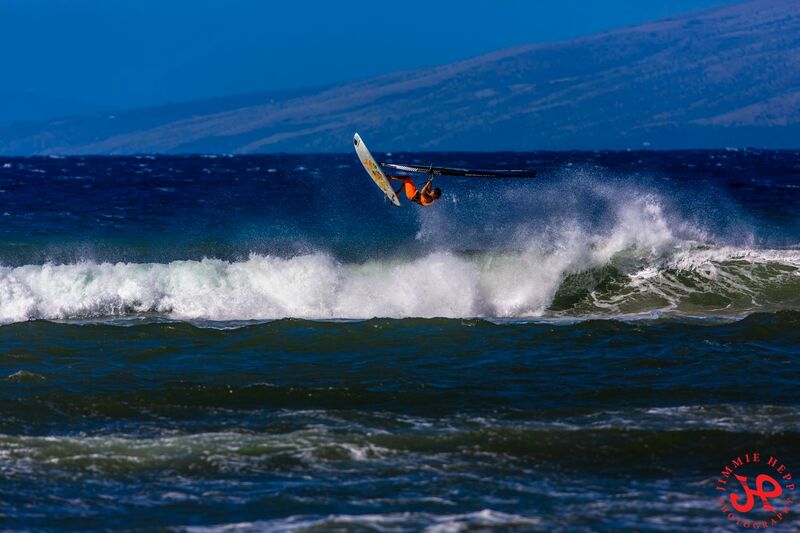 No wrap in Lahaina was confirmed, that only happens on big north swells. NW swell still pretty high at all the buoys, notice the change in direction at the NW one. A little more north in it, so it should hit Maui better. Honolua still the obvious place to go, which is why I won't go there. Below is the collage of (from the left): the actual Pauwela graph, my yesterday's prediction and Surfline's forecast, which was accurate size wise, but a bit late as far as timing. We can expect the swell to stay pretty steady throughout the day. Sunset Beach was too big to run the last day of the Triple Crown contest, which will be held today. Should be fun to watch. North Pacific has westerly narrow fetches. South Pacific got something too.